Unify .data() with HTML5 data attribute. How about other way round? 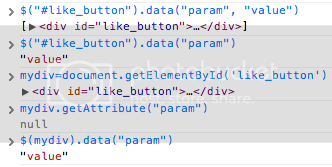 Enabling .data("value", "param") to be available outside of jQuery? See the top comments by Ryan Kinal: "It would be awesome if it were the element instead, but that is not the case." Why not just set the data- attribute if that's what you want? Attributes can only store strings, while .data() can store any type of value. Just saying that for string-only values jQuery can serve two way compatibility. Posted as an "enhancement" for a discussion. Reading is cheap, writing is not. data() precedes "data-*" and has semantics of its own to consider. Also this is probably a duplicate, but I can't find the original.